Dashboard Storytelling With KPIs: How To Tell Stories In Presentations? Plato famously quipped that “those who tell stories rule society.” This statement is as true today as it was in ancient Greece – perhaps even more so in modern times. Exclusive Bonus Content: Get our free guide for efficient dashboarding! Download our 10-step checklist and see how to tell the best data story. As far back as anyone can remember, narratives have helped us make sense of the sometimes complicated world around us. Rather than listing facts, figures, and statistics alone, people used gripping, imaginative timelines, bestowing raw data with real context and interpretation. In turn, this gripped listeners, immersing them in the narrative, thereby offering a platform to absorb a series of events in their mind’s eye precisely the way they unfolded. Here, we explore data-driven, live dashboard storytelling in depth, looking at storytelling with KPIs and the dynamics of a data storytelling presentation while offering real-world storytelling presentation examples. Dashboard storytelling is the process of presenting data in effective visualizations that depict the whole narrative of key performance indicators, business strategies and processes in the form of an interactive dashboard on a single screen, and in real-time. Storytelling is indeed a powerful force, and in the age of information, it’s possible to use the wealth of insights available at your fingertips to communicate your message in a way that is more powerful than you could ever have imagined. So, stay tuned to see the top tips and tricks we will now explain to be able to successfully create your own story with a few clicks. Marketers, salespeople, and entrepreneurs are today’s storytellers – they are wholly responsible for their data story. People in these roles are often the bridge between their data and the forum of decision-makers they’re looking to encourage to take the desired action. Different views answer different questions, so it’s vital to take care when choosing how to visualize your story. To help you in this initiative, you will need a robust data visualization tool. These intuitive aids in dashboard storytelling are now ubiquitous and provide a wide array of options to choose from, including line charts, bar charts, maps, scatter plots, spider webs, and many more. Such interactive tools are rightly recognized as a more comprehensive option than PowerPoint presentations or endless Excel files. But for optimum effectiveness, we still need more than a computer algorithm – here, we need a human to present the data in a way that will make it meaningful and valuable. Moreover, this person doesn’t need to be a common presenter or a teacher-like figure. According to research carried out by Stanford University, there are two types of storytelling: author- and reader-driven storytelling. An author-driven narrative is static and authoritative because it dictates the analysis process to the reader or listener. It’s like analyzing a chart printed in a newspaper. On the other hand, reader-driven storytelling allows the audience to structure the analysis on their own. Here, the audience can choose the data visualizations that they deem meaningful and interact with them on their own by drilling down to more details or choosing from various KPI examples they want to see visualized. Thus, they can reach out for insights that are crucial to them and make sense out of data independently. Storytelling for a dashboard presentation should always begin with stating your purpose. What is the main takeaway from your data story? It’s clear that your purpose will be to motivate the audience to take a certain action. Instead of thinking about your business goals, try to envisage what your listeners are seeking. Each member of your audience – be that a potential customer, future business partner, or stakeholder – has come to listen to your data storytelling presentation to gain a profit for him or herself. To better meet your audience’s expectations and gain their trust (and money), put their goals first and let them determine the line of your story. Storytelling with data, rather than presenting data visualizations alone, brings the best results. That said, there are certain enemies of your story that make it more complicated than enlightening and turn your efforts into a waste of time. The first of these bugbears are the various technology buzzwords that are devoid of any defined meaning. These words don’t create a clear picture in your listeners’ heads and are useless as a storytelling aid. In addition, to under-informing your audience, buzzwords are a sign of your lazy thinking and a herald that you don’t have anything unique or meaningful to say. Try to add clarity to your story by using more precise and descriptive narratives that truly communicate your purpose. Another trap is using your industry jargon to sound more professional. The problem here is that it may not be the jargon of your listeners’ industry – thus, they may not comprehend your narrative. Moreover, some jargon phrases have different meanings depending on the context they are used in – they mean one thing in the business field and something else in everyday life. They reduce clarity and can also convey the opposite meaning of what you intend to communicate in your data storytelling. The average person processes 100,500 digital words every day. By taking your data and transforming it into a focused, value-driven narrative, you stand a far better chance of your message resonating with your audience and yielding the results you desire. Human beings absorb information 60 times faster with visuals than linear text-based content alone. By harnessing the power of data visualization to form a narrative, you’re likely to earn an exponentially greater level of success from your internal or external presentations. Now that we’ve covered the data-driven storytelling essentials, it’s time to dig deeper into ways that you can make maximum impact with your storytelling dashboard presentations. Business dashboards are now driving forces for visualization in the field of business intelligence. 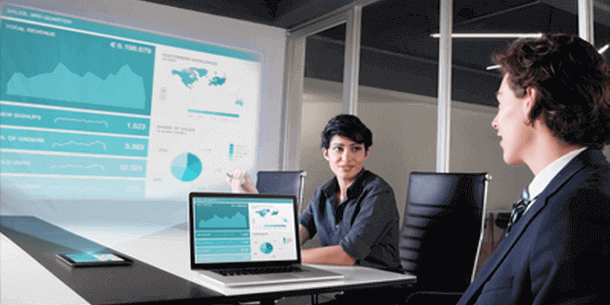 Unlike their predecessors, a state-of-the-art dashboard builder gives presenters the ability to engage audiences with real-time data and offer a more dynamic approach to presenting data compared to the rigid, linear nature of, say, Powerpoint. With the extra creative freedom data dashboards offer, the art of storytelling is making a reemergence in the boardroom. The question now is: What is great dashboarding? Without further ado, here are our top six tips on how to transform your presentation into a story and rule your own company through dashboard storytelling. Start at square one on how to present a dashboard: outline your presentation. Like all good stories, the plot should be clear, problems should be presented, and an outcome foreshadowed. You have to ask yourself the right data analysis questions when it comes to exploring the data to get insights, but you also need to ask yourself the right questions when it comes to presenting such data to a certain audience. Which information do they need to know or want to see? Make sure you have a concise storyboard when you present so you can take the audience along with you as you show off your data. Try to be purpose-driven to get the best dashboarding outcomes, but don’t entangle yourself in a rigid format that is unchangeable. Stephen Few, a leading design consultant, explains on his blog that “when we appeal to people’s emotions strictly to help them personally connect with information and care about it, and do so in a way that draws them into reasoned consideration of the information, not just feeling, we create a path to a brighter, saner future”. Emotions stick around much longer in a person’s psyche than facts and charts. Even the most analytical thinkers out there will be more likely to remember your presentation if you can weave elements of human life and emotion. How to present a dashboard with emotion? By adding some anecdotes, personal life experiences that everyone can relate to, or culturally shared moments and jokes. However, do not rely just on emotions to make your point. Your conclusions and ideas need to be backed by data, science, and facts – otherwise, and especially in business, you might not be taken seriously. You’d also miss an opportunity to help people learn to make better decisions by using reason and would only tap into a “lesser-evolved” part of humanity. Instead, emotionally appeal to your audience to drive home your point. Combining complicated jargon, millions of data points, advanced math concepts, and making a story that people can understand is not an easy task. Opt for simplicity and clear visualizations to increase the level of audience engagement. Making your presentation accessible to laypeople opens up more opportunities for your findings to be put to good use. No one likes being told what to do. Instead of preaching to your audience, enable them to be a part of the presentation through interactive dashboard features. By using real-time data, manipulating data points in front of the audience, and encouraging questions during the presentation, you will ensure your audiences are more engaged as you empower them to explore the data on their own. At the same time, you will also provide a deeper context. The interactivity is especially interesting in dashboarding when you have a broad target audience: it onboards newcomers easily while letting the ‘experts’ dig deeper into the data for more insights. Don’t be afraid to experiment with different approaches to storytelling with data. Create a dashboard storytelling plan that allows you to experiment, test different options, and learn what will build the engagement among your listeners and make sure you fortify your data storytelling with KPIs. As you try and fail by making them fall asleep or check their email, you will only learn from it and get the information on how to improve your dashboarding and storytelling with data techniques, presentation after presentation. Last but certainly not least is a tip that encompasses all of the above advice but also offers a means of keeping it consistent, accessible, and impactful from start to finish: balance your words and visuals wisely. What we mean here is that in data-driven storytelling, consistency is key if you want to grip your audience and drive your message home. Our eyes and brains focus on what stands out. The best data storytellers leverage this principle by building charts and graphs with a single message that can be effortlessly understood, highlighting both visually and with words the strings of information that they want their audience to remember the most. With this in mind, you should keep your language clear, concise, and simple from start to finish, using the best visualizations to enhance each segment of your story, placing a real emphasis on any graph, chart, or sentence that you want your audience to take away with them. Every single element of your dashboard design is essential, but by emphasizing the areas that really count, you’ll make your narrative all the more memorable, giving yourself the best possible chance of enjoying the results you deserve. Now that we’ve explored the ways in which you can improve your data-centric storytelling and make the most of your presentations, it’s time for some inspiring storytelling presentation examples. 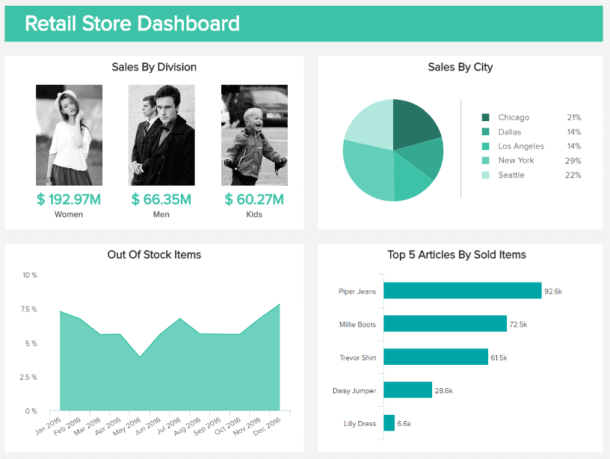 Let’s start with a storytelling dashboard that relates to the retail sector. The retail industry is an interesting one as it has particularly been disrupted with the advent of online retailing. Collecting data analytics is extremely important for this sector as it can take an excellent advantage out of analytics because of its data-driven nature. And as such, data storytelling with KPIs is a particularly effective method to communicate trends, discoveries and results. The first of our storytelling presentation examples serves up the information related to customers’ behavior and helps in identifying patterns in the data collected. The specific retail KPIs tracked here are focused on the sales: by division, by items, by city, and the out-of-stock items. It lets us know what the current trends in customers’ purchasing habits are and allow us to break down this data according to a city or a gender/age for enhanced analysis. We can also anticipate any stock-out to avoid losing money and visualize the stock-out tendencies over time to spot any problems in the supply chain. This most excellent of data storytelling examples presented in a retail dashboard will help you tell deeper, more intricate stories thanks to your marketing campaigns. These analytics enable us to adapt these campaigns per channel: we can see, by breaking down the Sales Volume by division, that women are the first point of revenue. Per city, New York adds up to almost 30% of the sales. All this information is important for customer retention as it is less expensive to retain the ones we already have than acquiring new clients. This second of our data storytelling examples delivers the tale of a busy working hospital. That might sound a little fancier than it is, but it’s of paramount importance – all the more when it comes to public healthcare, a sector very new to data collection and analytics that has a lot to win from it in many ways. 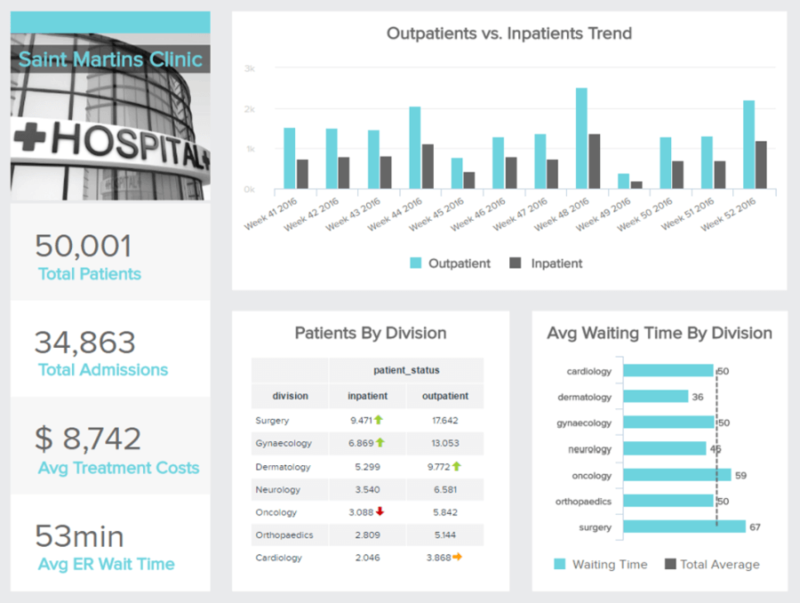 For a hospital, a centralized dashboard is a great ally in the everyday management of the facility. The one we have here gives us the big picture of a complex establishment, tracking several healthcare KPIs. From the total admissions to the total patients treated, the average waiting time in the ER, or broken down per division, the story told by this healthcare dashboard is essential. The top management of this facility have a holistic view to run the operations more easily and efficiently and can try to implement diverse measures if they see abnormal figures. For instance, an average waiting time for a certain division that is way higher than the others can shed light on some problems this division might be facing: lack of staff training, lack of equipment, understaffed unit, etc. All this is vital for the patient’s satisfaction as well as the safety and wellness of the hospital staff that deals with life and death every day. The third of our data storytelling examples relates to human resources. This particular storytelling dashboard focuses on one of the most essential responsibilities of any modern HR department – the recruitment of new talent. In today’s world, digital natives are looking to work with a company that not only shares their beliefs and values but offers opportunities to learn, progress, and grow as an individual. Finding the right fit for your organization is essential if you want to improve internal engagement and reduce employee turnover. The HR KPIs (human resources key performance indicators) related to this storytelling dashboard are designed to enhance every aspect of the recruitment journey, helping to drive down economical efficiencies and improving the quality of hires significantly. Here, the art of storytelling with KPIs is made easy. As you can see, this HR dashboard offers a clear snapshot into important aspects of HR recruitment, including the cost per hire, recruiting conversion or success rates, and the time to fill a vacancy from initial contact to official offer. With this most intuitive of data storytelling examples, building a valuable narrative that resonates with your audience is made easy, and as such, it’s possible to share your recruitment insights in a way that fosters real change and business growth. 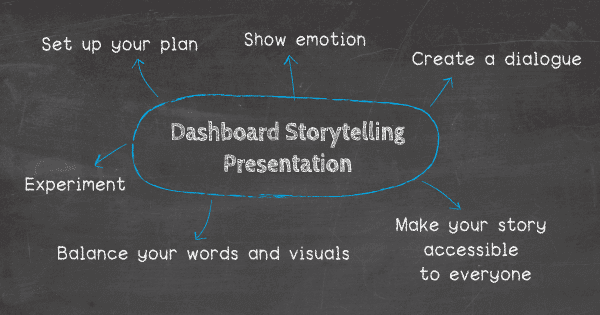 Start Your Dashboard Storytelling Now! One of the major advantages of working with dashboards is the improvement they have made to data visualization. Don’t let this feature go to waste with your own presentations. Place emphasis on making visuals clear and appealing to get the most from your dashboarding efforts. With the abundance of ways to visually present data, make sure you choose the one that works best with for great storytelling with data. For more tips, you can check out how to create data reports people love to read, but also find inspiration on how to create a dashboard with ease. Transform your presentations from static, lifeless work products into compelling stories by weaving an interesting and interactive plot line into them. Start now with datapine’s free 14-day trial!